As 2011 comes to a close, I thought I’d take a moment recap the top promotional products for this year. Several companies and trade associations gather information on promotional items with a focus on those items that help build awareness or incentivize customers to make a purchase. After looking at several lists the following items seemed to be the most popular this year. 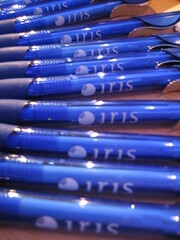 Pens – Even in this age of smart phones and tablet computers most people still use pens. This is still one of the most useful gifts you can give a customer and feel relatively good that the gift will get used. Warning: pens come in all levels of quality so make sure you don’t give someone a pen that will break or seem cheap. Tote Bags – People use totes for lots of reasons (including the green shopping bag craze). So, they are very handy to keep around. Just make sure your logo and tagline are big enough to stand out. T-Shirts– These are as big as ever, and thousands of people could see your logo this way. Try putting a QR code on the shirt to build interest in your website. Don’t forget high quality polo shirts with an embroidered logo for a high quality, professional look. Stress Balls– Seems like every year the stress gets greater, and there are more stress balls available to help people deal. Many different sizes and shapes are available to fit your selling proposition. Calendars– Even in this digital age people still use calendars to organize their lives and keep track of daily events. There are many options in size and function. From desk pads and wall mounts to small packet sized versions, there is a calendar to fit your promotion. Lanyards– Increased corporate security comes with more use of identification badges. Lanyards are the perfect way to build promotional value into these id badges. They can be worn by all employees and personalized with logos and other details. Key rings– One of the least expensive and yet well liked items. An attractive design is absolutely critical, people will only use it if the design is one they like. Coffee mugs – These are very practical and popular and they have enough space to get your logo and message across. People use mugs and will tend to keep them a long time. Promotional items are a fantastic buy, no other advertising medium can get the same results for the price. Just remember that you are presenting a gift, so make sure the quality and usefulness is equal to your sentiment because that is what the recipient is assuming.